It started with tablet… with free Minecraft demo version. Than with tablet Minecraft Pocket edition, and than grand ma asked my son Nitzan: ” what do you want for birthday?” And the answer was:”Minecraft for PC!!!! So 1.7.5 version arrived in our home and in our lives. As many will understand, it is simply Minecraft. 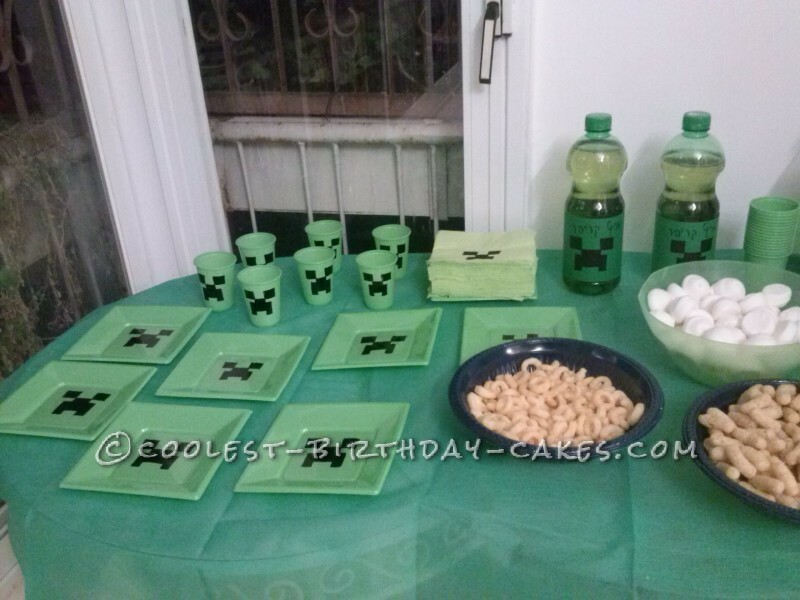 Thank the birthday party was getting close, and my son wanted cake with Minecraft picture print on sugar dough. I already bought ordinary decoration and than got to internet to look for the picture for the cake, 2 days before the birthday. 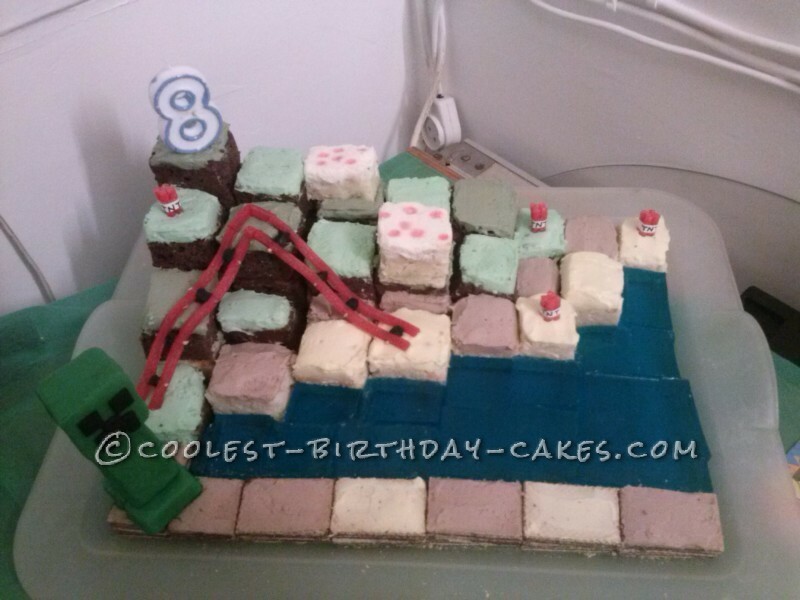 And than I have seen other ideas and released that I may make 3D Minecraft cake, and that I may even thought about Minecraft decoration. Well, it was at really short notice!! I started collecting cake and decoration ideas , thanks to all other wonderful mums that have done that before! By chance I found all green plastic plates, cups, napkins etc, and as well big sheet of green paper. 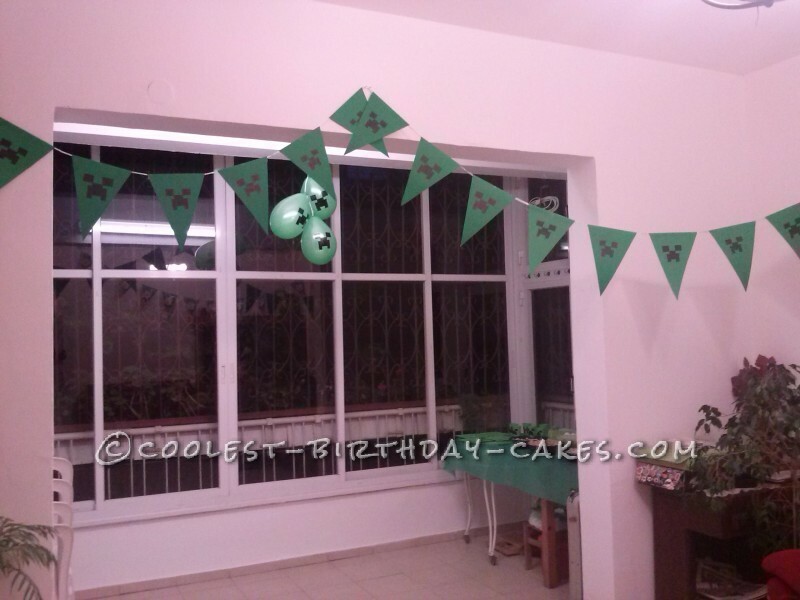 I cut the paper and made flags myself, and I drew all Creeper faces on anything green you can see: balloons, plates, cups, flags, napkins, and as well I bought specially apple juice, that turned to Cripper juice!!! Of course, I was working deep into night, since I did not have much time and my son should not have seen all this! Well, at so short notice, it turned pretty well. In general I need to plan for long time, I just did not have it this time. The red straps are train tracks, my son is very fond of making train tracks in Minecraft, small red birthday candles cut for TNT, and of course Cripper and all other things. Thanks a lot again to all other mum’s ideas, it helped a lot. You should see my son’s face!! He stood with open mouth for some time! It was worth the effort! And the party turned to big hit! Most of the time kids played Minecraft, of course. 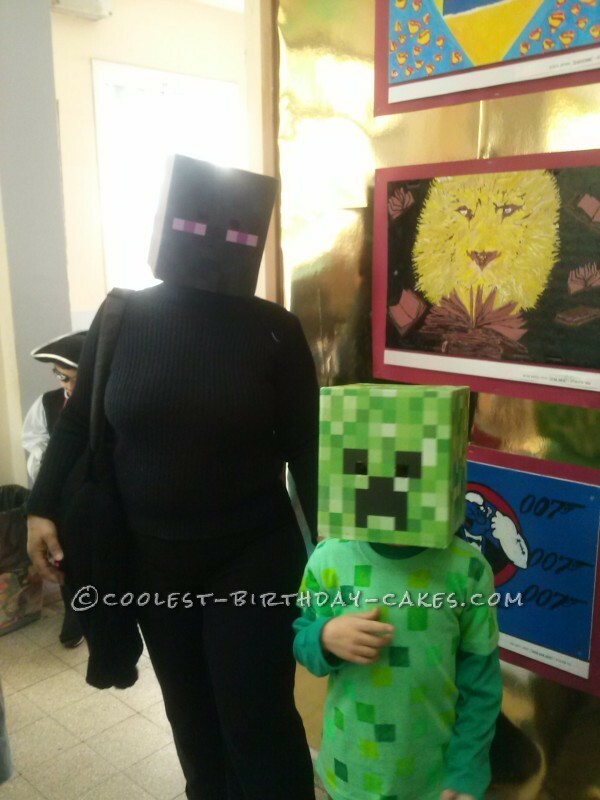 And later we made Purim’s costumes with Minecraft subject as well, as you cans see on last picture. It was a big hit as well.